It was a ‘kidneyversary’ for Sudbury toddler who spent years living at Ronald McDonald House. It’s now been just more than a year since three-year-old Sudbury boy TaylumLamoureux received the most important gift he’ll ever get — a new kidney. The woman who gave Taylum one of her kidneys visited the little boy last week, according to a May 13 post on the “A Tribe for Taylum” Facebook page. “We got the BIGGEST, most incredibly wonderful surprise today at Taylum’s party to celebrate his one year ‘kidneyversary,’” said the post by Taylum’s mom, Desiree. Pan Am torchbearer continues to keep the memory of her son, David, alive through foundation. In a sense, Michelle McKinnon has been carrying a torch in memory of her son, David, since he passed away from kidney failure in four years ago. However, she did so in a more physical way this past summer when she was a torchbearer for the Pan Am Games, running a 200-metre leg down Queen Street to City Hall. It didn’t go unnoticed. 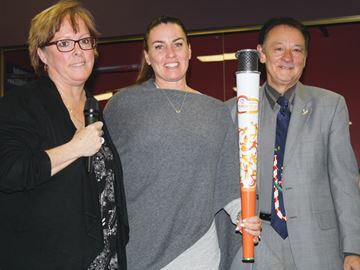 The Ontario Lottery and Gaming Corporation, a primary sponsor of the run, honoured MacKinnon, an instructor at Kicks for Kids in Burlington, on Dec. 16, presenting her with one of five memorial torches that were handed out by the agency. Please click here to read the full article on Niagara This Week. 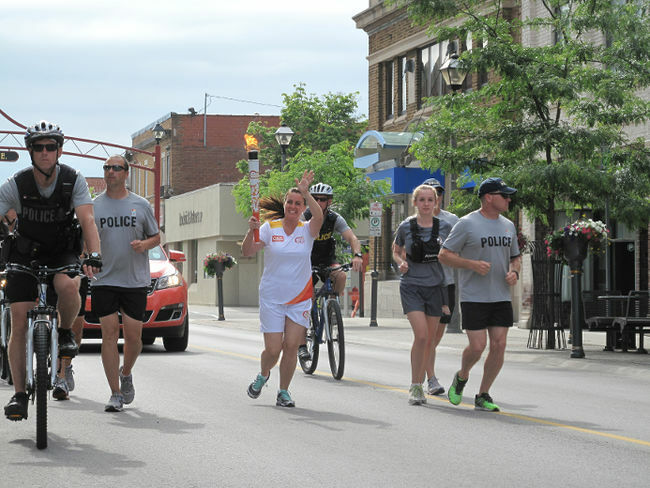 One month after donating one of her kidneys, Michelle MacKinnon carried the 2015 Pan Am torch during a community celebration in the Honeymoon Capital Saturday. “It was exciting. It was a very short distance, under a kilometre, so I didn’t have to go very far, which is good because I’m recovering,” she said following the relay. On May 13, MacKinnon underwent surgery to remove her left kidney and donated it to a little boy she barely knows. 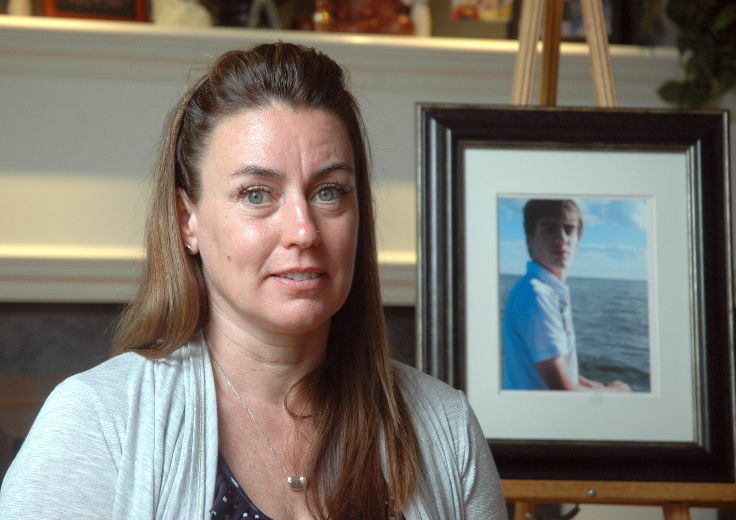 In 2011, the Niagara Falls woman was set to give the gift of life to her 18-year-old son, David. He had been sick all his life and had been on dialysis for nearly two years. But the mother-to-son kidney transplant was postponed twice, and David had a stroke three days before the third attempt. He died, June 8, 2011, on the day he was to receive his mother’s kidney. Click here to read the full article in the Niagara Falls Review. CityNews reporter Andrea Piunno brings us the story of a woman who lost her son to an illness now undergoing life-altering surgery to help save someone she barely knows. Michelle MacKinnon made good on her promise. To herself. And to a little boy she barely knows who desperately needed a kidney. At 8 a.m. Wednesday, MacKinnon’s surgery began at the Toronto General Hospital to remove her left kidney, said her husband Dave. By about noon, she was in the recovery unit and an hour later, Dave was by her side. MacKinnon asked several times about the boy before she fell back to sleep. The Niagara Falls, Ont., couple had been waiting for this day for a long time. In 2011, MacKinnon was set to give the gift of life to her 18-year-old son, David. He had been sick all his life and had on dialysis for nearly two years. Click here to read the full article in the Toronto Sun by Cheryl Clock. It was supposed to be a gift of life for her son. Her left kidney. A perfect match and a chance for her 18-year-old son to get off the leash of dialysis and have the healthy life that he deserved. 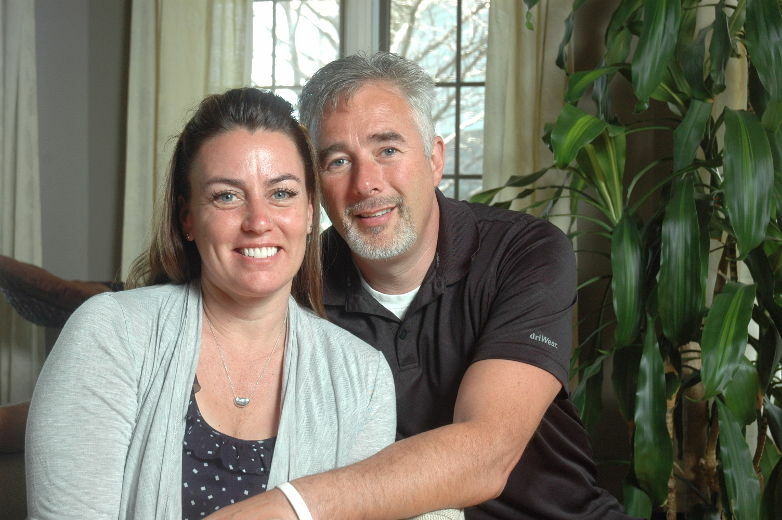 Three days before the transplant, David MacKinnon had a stroke. He died, June 8, 2011, on what was to be the day his mother, Michelle, would have given him a kidney. Click here to read the full article in the St. Catharines Standard by Cheryl Clock. They used to walk together. Around the block. Every day. They talked about everything, even topics no mother and son should ever have to discuss. Like dying. During one walk, shortly before Michelle MacKinnon was set to give her left kidney to her 18-year-old son, David, they talked about their wishes should something go wrong. David was worried. “I don’t think it will happen,” he said. The Niagara Falls teen was getting sicker. And due to various reasons, the transplant surgery had already been postponed. Michelle was determined to stay hopeful.